Many significant failures—from FEMA’s response to Hurricane Katrina to the recent economic collapse—could have been prevented or mitigated if those lower in the hierarchy were successful at communicating to leaders the risks they saw in the system. Ira Chaleff’s Courageous Follower model has facilitated healthy upward information flow in organizations for over 15 years. The Harvard Business Review called Chaleff a pioneer in the emerging field of followership—this new edition shares his latest thinking on an increasingly vital topic. 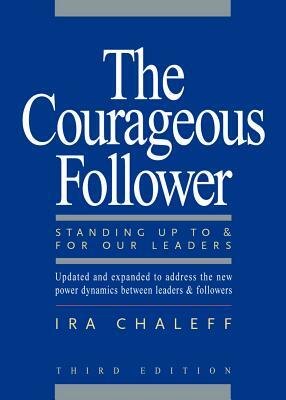 The updated third edition includes a new chapter, “The Courage to Speak to the Hierarchy.” Much of Chaleff’s model is based on followers having access to the leader. But today, followers can be handed questionable policies and orders that come from many levels above them—even from the other side of the world. Chaleff explores how they can respond effectively, particularly using the power now available through advances in communications technology. Ira Chaleff is the founder and president of Executive Coaching & Consulting Associates. He was recently named one of the top100 thinkers on leadership by Leadership Excellence magazine.